IRVINE, Calif. (November 22, 2017) – The Mazda CX-5 compact crossover SUV continues to win the hearts of critics and customers, with its sales off to a record pace since the second generation went on sale this past spring. The entry-level CX-5 Sport features cloth upholstery, standard LED headlights, 17-inch alloy wheels, an electronic parking brake, MAZDA CONNECTTM infotainment with a 7-inch screen and Bluetooth audio streaming and phone pairing as standard, among a much longer list of features. In its newly available Sport i-ACTIVSENSE Package, CX-5 adds High Beam Control, Lane Departure Warning, Lane-Keep Assist, Mazda Radar Cruise Control, Smart Brake Support, rain-sensing windshield wipers and automatic on/off headlights. The available Touring Preferred Package includes auto-dimming rearview mirror with Homelink®, BOSE® 10-speaker audio sound system with Centerpoint®2 and AudioPilot®2, navigation, a power glass moonroof and a power liftgate. Further building on the Touring Preferred Package, the top-trim CX-5 Grand Touring receives new 2-position memory driver’s seat and 6-way power adjustable passenger seat. CX-5 Grand Touring comes standard with leather-trimmed seats, LED fog lights and tail lights, Adaptive Front-lighting System and SiriusXM® satellite radio with 4-month trial subscription. The available Grand Touring Premium Package includes windshield-projected Active Driving Display head-up unit with Traffic Sign Recognition, heated steering wheel, heated second-row outboard seats and windshield wiper de-icer. 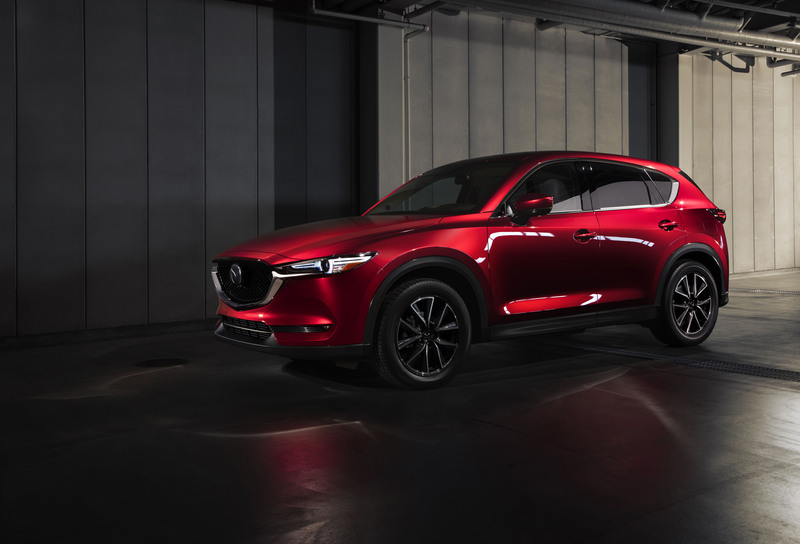 CX-5 has earned the IIHS “Top Safety Pick” or “Top Safety Pick+” designations for the fifth-consecutive year in 2017, joining all Mazda models tested to earn the nonprofit’s highest award when equipped with proper headlights and specific technologies. The 2018 Mazda CX-5 will arrive at dealerships nationwide in the beginning of December. MSRP does not include $975 for destination and handling ($1,020 in Alaska), taxes, title or additional fees. Dealers set actual sale prices.